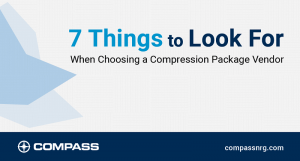 Sometimes a compression vendor’s best work takes place before the project is even awarded. When a Request for Quote arrives at Compass, it lands in Barclay Sexsmith’s inbox. As Manager of Engineering Applications, he leads an experienced, tight-knit team that addresses the technical specs for RFQs. In some cases, the requested solution is the best answer for the production situation. Very often, however, Sexsmith’s team can investigate and recommend a solution that meets the client’s needs even better than the solution being r equested. The Applications team’s experience spans a wide range of compression equipment, field conditions and operational scenarios. Process simulation software – well-known in the industry, but used more strategically at Compass – helps Compass engineers maximize up-time and performance while containing costs. Ongoing communication between Applications and Project Management ensures the solution that’s ultimately chosen can be built and delivered efficiently. It would be easy enough to take the customer’s RFQ, cut-and-paste specs for the requested equipment and staple a price sheet to it. Compass does more. By asking the right questions, adding their own experience and painstakingly working through the simulations, Compass application engineers can often propose something better. This ultimately saves the customer time and money, while guarding against problems out in the field. For Barclay Sexsmith and his team, that’s all part of the Compass difference.